Long Beach, Calif. – June 18, 2016 – Formula DRIFT presented by BlackVue returned to New Jersey for Round 4: The Gauntlet. Vaughn Gittin in the Monster Energy / Nitto Tire Ford Mustang RTR takes the victory and takes the lead in the Pro Championship standings. Round 4: The Gauntlet returned to Wall Speedway for the eleventh time as the season hits the mid-way point. Fans witnessed a highly competitive round of competition. The event had over 400,000 views on the Livestream. The action packed event found Ken Gushi in the GReddy Racing / Nexen Tire SR by Toyota 86 against 2-time Formula DRIFT champion, Chris Forsberg in the NOS Energy Drink / Hankook Tire Nissan 370Z in the semi-finals. Gushi made a detrimental mistake on his chase run that gave Forsberg the win to move him into the Finals and on the podium for his third consecutive event. Gushi moves into the fourth spot for the Championship. Rookie Alex Heilbrunn in the RTS Monster BMW M3 faced off against the 2010 Formula DRIFT champion Vaughn Gittin on the other side of the bracket in the semi-finals. 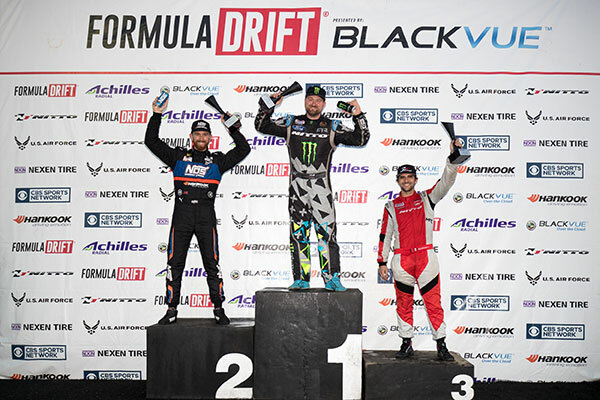 The speed and consistency of Gittin was too much to overcome for the rookie, however Heilbrunn ends up in third place for his first ever Formula DRIFT Pro Championship podium. The finals were a battle of champions with Gittin versus Forsberg. Gittin remained tough to beat and edged out his opponent for his second victory of the season to move into the top spot in the standings. The 2016 Formula DRIFT Pro Championship will continue to Round 5: True North on July 15-16, 2016 at Autodrome St. Eustache in Canada. For more information visit, www.formulad.com and find Formula DRIFT on Instagram @formulad, Facebook www.facebook.com/formuladrift, Twitter @FormulaD, and snapchat formula_drift. Tune into Formula DRIFT on CBS Sports and check your local listings for airtimes.